Academy Award Nominee Queen Latifah to Star as "Auntie Em"
International R&B super star Ashanti is set to make her leading lady debut as "Dorothy" in the original telefilm, "The Muppets' Wonderful Wizard of Oz," for the ABC Television Network. Joining her in this madcap adventure movie are actress/rapper/producer superstar Queen Latifah ("Chicago," "Barbershop 2") as her beloved guardian "Auntie Em" and action film master, director Quentin Tarrantino ("Kill Bill," vols. 1 and 2) in a cameo as himself. "The Muppets' Wonderful Wizard of Oz" is slated to begin production in Vancouver, BC on September 20 and will air in the 2004-05 season as part of the hit family franchise, "The Wonderful World of Disney." Of course the biggest star in the telefilm - she's absolutely certain - is Miss Piggy, who will take on the roles of all four witches: Wicked Witch of the East, Wicked Witch of the West, the Good Witch of the North and Glinda, the Good Witch of the South. Kermit the Frog is the Scarecrow, in search of a brain; The Great Gonzo is the Tin Man, in search of his heart, and Fozzie Bear is the Lion looking for some courage. Pepe the King Prawn takes on the role of Toto, Dorothy's constant - and constantly chattering - sidekick. 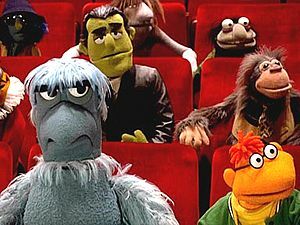 "We're excited to be working with these award-winning and talented artists on our first project since the Muppets joined The Walt Disney Company earlier this year," said Chris Curtin, general manager and vice president, Muppet Holding Company. "I know that Kermit, Miss Piggy and the rest of the Muppet gang, together with Ashanti and Queen Latifah, will certainly add a one-of-a-kind twist to this classic story and will entertain and inspire television audiences everywhere." Based on the book "The Wonderful Wizard of Oz" by L. Frank Baum, the Muppets version gives the story a couple of twists and tweaks without ever losing the central meaning of the classic story. Contemporary teenage Dorothy is a girl with dreams of showbiz that seem far from coming true in the Kansas trailer park where she lives. When she's transported to the magical land of Oz, she joins with the Scarecrow, the Tin Man and the Lion to fight the Wicked Witch of the West and journey to the Wizard, who, she hopes, will make her a star! The last Muppets telefilm, "It's a Very Merry Muppet Christmas Movie," won its time-slot with a 3.8 rating and over 11 million viewers. The numbers are just as impressive for Ashanti. In 2002 her debut album, "Ashanti," topped the Billboard Album Chart and also won the Grammy for Best Contemporary R&B Album. Her follow-up release, "Chapter II," debuted in the no. 1 slot on the Billboard Album Chart and spawned two Top-10 singles. She is certainly no stranger to television, having performed on virtually every music awards show from the American Music Awards to the Grammys, the MTV Video Music Awards, MTV Europe Awards, the Soul Train Awards and the Kids' Choice Awards. "This one movie brings together three of entertainment's most recognizable franchises," said Quinn Taylor, senior vice president, Motion Pictures for Television and Miniseries, ABC Primetime Entertainment. "'The Wonderful World of Disney," the Muppets and the story of 'The Wonderful Wizard of Oz.' It's thrilling to have a project where there is something to motivate literally every single demographic to watch." Lisa Henson and Brian Henson are executive producers of "The Muppets' Wonderful Wizard of Oz." Martin G. Baker and Warren Carr are producers and Bill Baretta and Kristine Belson are co-producers. The telefilm is being directed by Kirk R. Thatcher ("It's a Very Muppets Christmas Movie.)" "The Muppets' Wonderful Wizard of Oz" is being produced by The Jim Henson Company in association with Touchstone Television and Muppets Holding Company, the Disney subsidiary responsible for managing the overall Muppets franchise.